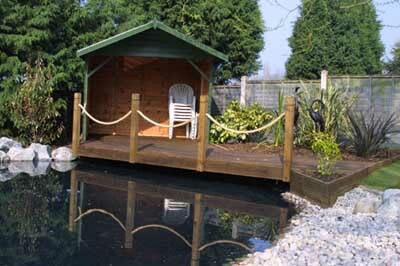 The Hutchinsons team of craftsmen specialise in creating bespoke garden rooms. Each building is individually designed and constructed from the highest quality raw materials in our modern workshop based near Colchester in rural Essex. The timbers used in our buildings are sourced from sustainable woodlands and processed by local merchants before being pressure treated with a clear preservative to ensure long life in the finished building. In the pages of this web site you will be able to view a range of building styles ranging from our basic utility storage sheds and workshops, to our unique summerhouses. As all of our buildings are individually designed and built to order we also present information on specially commissioned garden rooms which include features such as double glazing, insulation, power & lighting. With the addition of a simple heater, these buildings can be warm year round and are often used as home offices or hobby rooms. All of our garden features are individually designed and hand crafted to order. As a result, we are able to tailor the standard designs featured on this web site to meet our clients' personal requirements. Alternatively, we are happy to discuss individual projects and prepare drawings for clients wanting a more unique building design. Hutchinsons have been invited to introduce a range of display buildings into a few select garden centres across Suffolk & Essex. 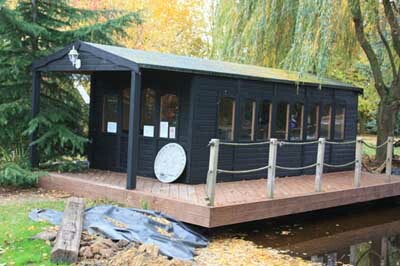 At these sites, visitors are able to view a sample of our premium quality, hand made buildings and timber features. Click on the Display Centre tab at the top of the page to view a map highlighting these sites together with a list detailing the buildings on display at each site.